A maker of embedded systems has published details regarding pricing of Windows 10 IoT Enterprise licenses in Q4 2017 and has also disclosed the model numbers of Intel’s upcoming Gemini Lake SoCs. As it appears, Intel is likely to be readying at least six processors, for desktops and laptops, that will be sold under the Celeron and the Pentium Silver trademarks. According to the table published by Quarta Technologies, a Russian based IoT provider, Intel is set to offer the J5005 and N5000 SKUs for desktops and mobiles (respectively) under the Pentium Silver brand, as well as the Celeron J4005, J4105, N4000 and N4100 models. 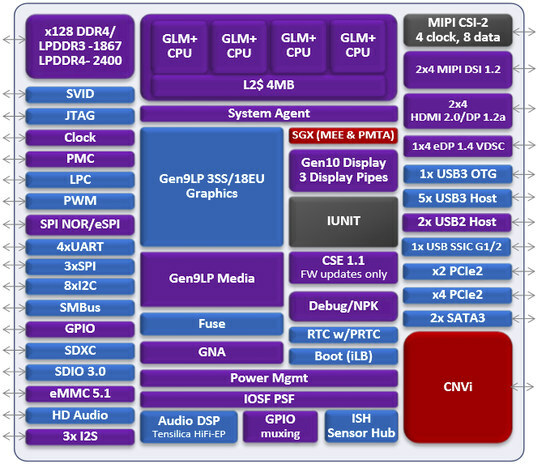 As with the previous generation Apollo Lake lineup, the list of Gemini Lake shows six SoCs in total: three chips for mobile and three chips for desktop computers. It is not known if this is a final list as of yet. Detailed specifications of the processors will be published when Intel finalizes them and publically introduces the entire lineup, but in the interim we can discuss what we know about the new parts. According to CNX-Software, who inspected Linux patches for the new SoCs, the Gemini Lake parts have many similarities with the existing Apollo Lake chips, but also feature a number of tangible improvements in both performance and functionality, CNX-Software also generated a block diagram of the new processors. As far as the documents we have suggest, Gemini Lake is set to use revamped Goldmont 'Plus' x86 cores that feature a four-wide issue design, (compared to three-wide in regular Goldmont) accompanied by 4 MB of unified L2 as a last level cache. This alone should improve the performance of the new SoCs, but it is hard to make predictions without knowing the frequencies of the upcoming chips or other microarchitecture changes. The new SoCs are listed as having a 128-bit memory controller that supports DDR4 and LPDDR3/4, although it remains to be seen whether all designs will use all the memory channels. When it comes to graphics, the parts are expected to use the same Gen9LP core with up to 18 EUs as the Apollo Lake (which provides the Direct3D Feature Level 12_1 feature set) and therefore to offer a performance improvement over the predecessor it will have to run at a higher frequency. The integrated should be equipped with an improved multimedia encoding/decoding engine (supporting 10-bit VP9 among other things), and Intel’s Gen10 display controller supporting HDMI 2.0 output. 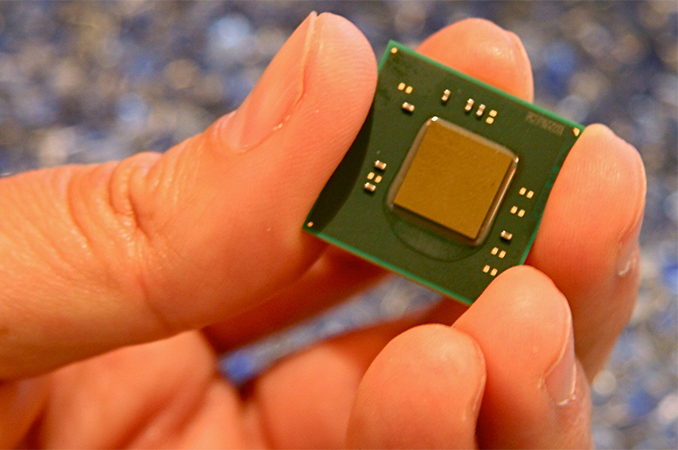 Furthermore, the Gemini Lake is set to support Intel’s SGX that is required by some multimedia applications because of the latest DRM technologies. When it comes to storage, Gemini Lake should support traditional SATA drives, PCIe 2.0 x2/x4 SSDs, and eMMC 5.1 storage solutions. As for connectivity, the new SoCs should support USB 3.0/2.0, USB Type-C, SPI, SDXC and other modern buses. Furthermore, the chips are likely to feature to the CNVi (Connectivity Integration Architecture) block for Wi-Fi, Bluetooth and baseband modem. Finally, Intel has reportedly updated speed acceleration engine of the Gemini Lake to support dynamic neural networks algorithms. At present, nothing is known about power consumption of the new Gemini Lake SKUs, but it might be logical to expect them to be comparable to the existing Apollo Lake SoCs (10 W for desktops, 6 W for mobiles). Launch Q1 2014 H1 2015 2015 H2 2016 H2 2017? Intel traditionally does not comment on unreleased products, their functionality, and branding. We're expecting Gemini Lake to be launched at some point, but it seems as if the IoT suppliers have sufficient information to start promoting the parts. Sources: Quarta Technologies (via FanlessTech), CNX-Software. Now even Atom have 4-wide execution engine. Is there any mainstream CPU that isn't 4-wide.